Embossed pattern complements square-cut display window for a winning custom presentation. Includes cover sheet for laser or inkjet printing. Provides an elegant viewpoint and a holder for your business card. Note: A minimum quantity of 20 must be ordered, and in units of 20 thereafter. 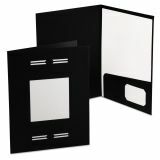 Oxford Imperial Series Laserview Business Portfolio, Premium Paper, Black, 10/Pack - LaserView Business Folders produce professional, customized reports with any inkjet or laser printer. The Imperial series is great for putting your best foot forward at every business meeting even when you have little time to prepare your documents. Simply create your graphics and titles on your computer and feed the included cover "view" page through your desktop printer. Then insert in the display window. Embossed patterns and design cutouts on portfolio convey a look of quality and distinction. 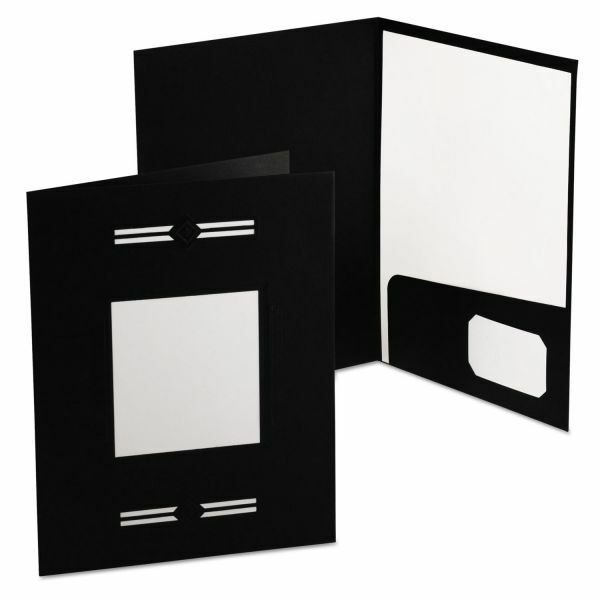 Folders hold letter-size documents. Offer die-cut business card holder and single pocket design.